Prominent & Leading Manufacturer from Mumbai, we offer modular enclosure system for lighting distribution boards and modular enclosures. Modular Enclosure System for Lighting Distribution Boards is used in Motor Control Centers, Power Control Centers, Capacitor Panels, Metering Panels. These are small units where enclosure system are being inbuilt. We have in store for our clients Modular Enclosures, that are available in knock-down kits and are tested for 50 KA. Our product is demanded for easy assembly & wiring design and enhanced production efficiency. The enclosure helps in reducing the dead inventory because of the availability of ex-stock. 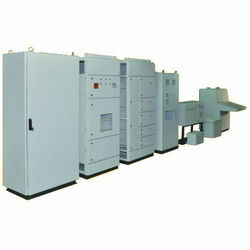 Modular Enclosures are designed after thorough market research & use of advanced technology like switchgear by Siemens, L&T, Schneider, GE, ABB & other brands. The systems lets you configure your panel based on the site conditions (top-bus or bottom-bus design can be configured using the same parts). The modulo range is designed to enable quick assembly using standard tools. Thus giving you the chance to plan your job on the go. The entire range of modular enclosures is fabricated from the finest of materials with the use of the latest sheet metal fabrication design ET manufacturing tools. Thus making them the perfect blend of eye-catching aesthetics cost-effective design. The range is designed to satisfy all the strain -gent technical requirements ET its thereby suited to meet diverse requirements under extreme ambient site conditions. It is spec -laity designed to incorporate the entire range of switchgear available from Siemens, LET, Schneider, ABB, GE etc. 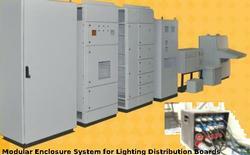 Looking for Modular Enclosure System for Lighting Distribution Boards ?